Originally published under the title "The New York Times Does It Again!" 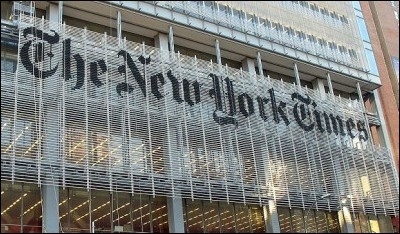 Thursday's edition of the New York Times focused on slanted Israel coverage, to the virtual exclusion of news on Syria, Iraq, and other hot spots. The New York Times has done it again! Just when I think they couldn't possibly be any worse—they have the power to surprise and disgust me anew. Six days ago, 14 nations on the UN Security Council (with America's abstention), voted in Resolution 2334--and we know that Obama was behind this resolution, just stay tuned for "iron clad" evidence. Yesterday, Obama's Secretary of State, John Kerry, delivered his shameless lecture in which, as Israel's "friend," he demanded that it commit suicide by appeasing terrorism even further in the pointless, fruitless process known as the "two state solution." And today—the New York Times devotes five articles—yes, five separate articles, to further buttress and defend Kerry's vision. Under the bold headline "Kerry Says Israel Keeps Sabotaging Peace Prospects," we find two front page right hand "lead" articles. David E. Sanger ("Kerry Rebukes Israel, Calling Settlements a Threat to Peace") spends 1,612 words "voicing frustration at Netanyahu." In Thursday's paper of record we have 5,933 words of highly slanted Israel coverage. Right next to him, Peter Baker ("In John Kerry's Mideast Speech, a Clash of Policies and Personalities"), spends 1,320 words claiming that the "two state solution nears the end of its shelf life." Both articles continue on page A10 and take up the entire page. The pull quotes read: "A bluntness rarely heard from U.S. diplomat about a close ally," and "Kerry plays for history, while Netanyahu and Trump play for time." This is not straight news reporting. This is an editorial. Really, it is rank propaganda. On page A11, opposite, there is another article by Jonathan Martin ("Kerry's Blunt Words for Israel Denounced by Lawmakers in Both Parties"). The pull quote here reads: "A speech is greeted warmly in Europe but with a shrug in the Arab world." This article is 872 words in length. Not to be trumped by their own journalists, the NYT editors spend their entire editorial on: "Is Israel Abandoning a Two-State Solution?" The word count here is 1,228 words. Of course, Thomas Friedman, whose column appears opposite the editorial, spends 901 words in an article titled: "Bibi Netanyahu Makes Trump His Chump." This coverage, which is entirely one-sided and based on falsehoods, distortions, and false moral equivalencies, amounts to almost 6,000 words (5,933 words to be exact). So in Thursday's paper of record we have thousands of words highly critical of Israel and only of Israel. The Palestinians' consistent refusal to recognize the Jewish state, to cease their terrorism against it, their refusal of offers of more than 95% of disputed territories—that is both underplayed and never viewed as the main reason that the "peace process" has failed. Most people do not read or study entire articles. They are guided by the headlines, the pull quotes, and perhaps by the opening paragraphs. If a presumably distinguished newspaper spends that many words on the same day featuring a single country—then this must be major breaking news. Yes? The first and only mention of Islamic terrorism in today's paper appears on page A12 (Tunisian Detained as Possible Accomplice in Berlin Attack) and concerns a possible accomplice in the Tunisian truck attack in Berlin. We learn nothing about Syria, Iraq, Sudan or Iran. We are not kept apprised of the region's continual melt-down into barbaric chaos, the vast flood of refugees—especially the horrifyingly under-valued Christian refugees in the region. I have said this before and I'll say it again: The New York Times is guilty of the filthiest propaganda when it comes to Israel, Judaism, and Islam. It alone has indoctrinated and brainwashed all those who read it, day after day, and who swear it is their "Bible." May I strongly suggest that everyone read Daniel Pipes in the current issue of Commentary? He has written a clear and concise analysis of how Israel itself will be able to make peace. It is titled: "A New Strategy for Israeli Victory." Phyllis Chesler, a Shillman-Ginsburg fellow at the Middle East Forum, is an emerita professor of psychology and women's studies and the author of sixteen books.